It’s almost Valentine! And any board game can be romantic… with a little rhyming skill as we’d like to show with this week’s comic! 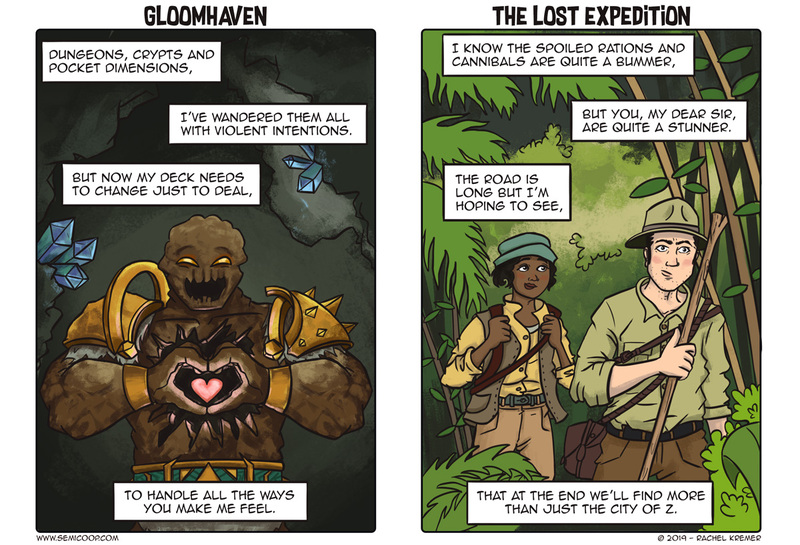 And who knew that Cragheart from Gloomhaven had a soft side to him? 😉 In 2016, we’ve published our first board game poems which were about Netrunner and Eldritch Horror. This game night made up for our lack of playing games this week because I was simply too busy with work. We did play a game of Arraial last night and this time we did not forget the 2-player rule to take out eight cards. Last time we played it, we were already wondering why the rounds took so long, whoops! This week we’ll continue our Gloomhaven campaign and hopefully, Heinze and I manage to squeeze in some more board gaming time. Share your board gaming poems with us in the comments!